Oh yeah... That's right.. You may have read on my challenge partners blogs yesterday that we are taking on the 31 Nail Art Challenge once again. Last year we started on this exact same date. This year we will only be doing a challenge prompt Four times a week. 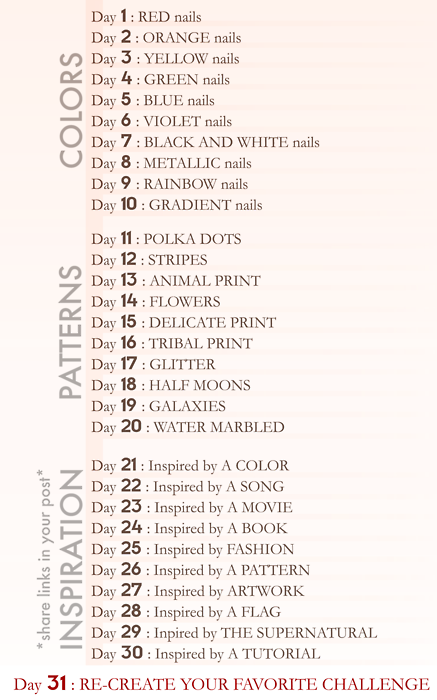 I am so excited to take this challenge on once again with Sam of The Nailasaurus and Rie of Nails and Noms. It has been exactly one year today! I am so excited to see how much we all have improved! Last year we all did amazing and had a blast so this year should be even better and even more fun! The prompt for Day One is Red Nails. Red is not a color that inspires me, at all. So, in true LTHP fashion I waited until the last minute to work on my Day One nails... I ended up with Three different "Red" looks and loved none of them. So I figured, why not show all Three? It's not that they were bad, it's just.... Red..... Can you tell I'm not into Red? Anyway's I've whined enough lol! Onto the nail looks! For this look I started with a base of The Balm's (Hot Ticket) That's Rediculous. To create the clouds I used The Balm's Pink or Swim and Coral Reef-ined. Pink or Swim (in the middle of the cloud) turned out to be a little more jelly like than I was hoping but still opaque enough for the cloud technique. That's Rediculous and Coral Reef-ined have a really nice, opaque and dense(not thick) formula. And there you have look one, Sunset Clouds :D.
Red Look Two: Kissy Face! For this look I started with a base of Twee & Honey's Hallow (LOOOOOVEEEE) which is just lovely and I will cover later on. For the kisses I used Bundle Monster Plate BM02 and Konad Red Special Polish. On my pinkie I used an ebay plate, Chinese brand QA, plate QA28. I topped it all off with some Seche Vite, followed by Twee & Honey's This is Matteness, matte top coat (new fave matte top coat!!!). This is a cute look, but not really my style. I wanted to try something different though. For this look I started with a base of O.P.I Danke- Shiny Red. I followed the Red base with the cling wrap technique with O.P.I Mourning Glory. For the stamp I used Konad plate M83 and China Glaze Passion. This look was pretty severe and eye-catching, but again, not my thing. My stamping is SO sloppy! It's been a while since I've stamped o.O. And there you have Day One of the 31 Day Challenge! I can't believe we are doing this again! I believe we shall be back on Saturday with Day Two of the challenge which I am looking forward to more so than this one. ANYTHING but Red!!! 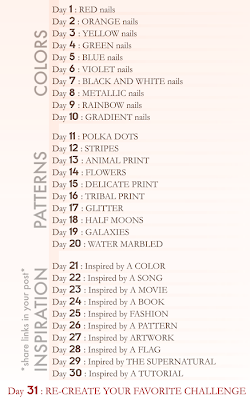 Here is a list of the prompts we will be following! Now don't forget to stop by my challenge partners Rie and Sam's to see their Red looks for day One! Hopefully they are doing better than I am lolol!!! I can't wait to see what they came up with!! Hehe :). Indecision 2012! Too funny! I personally LOVE the clouds & the colors you chose. But, I love red ;). I'm excited to watch you girls make your way thought the challenge! 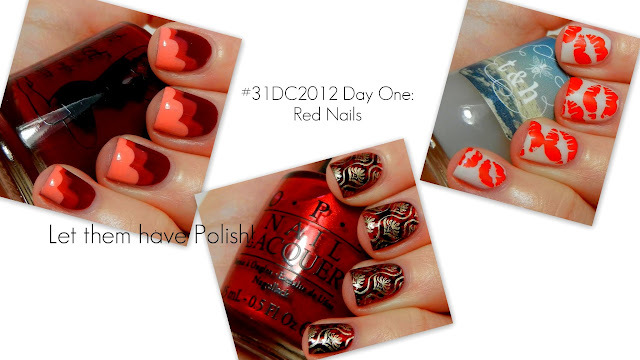 All of these are so stunning I love red on nails! I love your Ornate Steampunk look! They all turned out fab, but that's my favourite! These look fantastic! I love the variety of the first challenge, very nicely done and super creative! I really like the clouds design!!! If every challenge day has at least 1 manicure that is as awesome as these are all, I am having a blast with this ♥. Wow, that third one is just...(picks jaw up)...I love! Too bad you don't like red, because it really is lovely. Haven't tried stamping yet but I might have to now! BM plate 2 with kisses is one of my favorites and I did a similar design on my blog some time- so that one has to be my favorite! But the ornate steampunk is pretty awesome as well! I am like you- I am not a huge red fan- unless its dark and vampy or glittery. I agree, I'm definitely not a red girl but I think all of these look really good! My favorite is the ornate steampunk, it looks so rich and classy. That Sunset Clouds nail art look amazing! Holy crap! These are amazing!!! Oh my god, that Ornate Steampunk one is INCREDIBLE! I LOVE IT!!!! These are gorgeous! I particularly love the last design, the cling wrap effect gives it such a nice and interesting look peeking through! I really love the matte finish on your second manicure! Wow! Love all the looks. I really like the kissy nails. They would b great for valentines day! How did you do the cloud manicure? Was that freestyle? It's amazing I'd love to know how to do it!